Content: There some descriptions of horrible events, but nothing graphic. I think younger readers might have problems with the languages — there’s French and Latin, though translations are provided — and some of the names, but it’s in the middle grade (grades 3-5) of the bookstore, and I think it fits there. Theodora (call her Theo) Tenpenny is the granddaughter of an artist and the daughter of an extreme introvert. She lives in what was once a grand old New York City house, but over the years has become neglected. Her grandpa Jack has kept everything reasonably in shape over the years and has managed to keep the family afloat by being mostly self-reliant. But since he was hit by a car and died (which seems overly gruesome for a guy in his mid-80s), Theo’s been in charge. And she’s struggling. 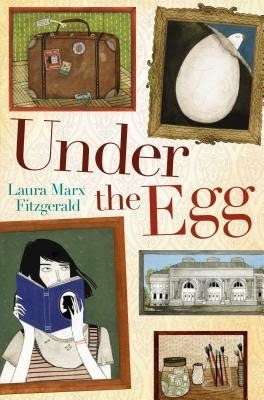 That is, until she takes her grandfather’s last words — “Look under the egg” — literally, and discovers that he’s been hiding a very old painting underneath the one of an egg that’s been hanging over their mantelpiece for years. Because she’s spent her life in her grandfather’s shadow, going to the Met and other art museums, Theo has a good eye, and realizes at once that this painting is something special. Something, perhaps, worth a lot of money. However, as she and her new friend, Bodhi, find out, declaring a painting a lost work by a master is easy. Proving it is another matter. Especially when it turns out that this could be looted Nazi treasure. On the one hand, there’s a lot of information to be had in this slim book. Both art history as well as WWII history play a major role in the plot. But I think that Fitzgerald handles it well, even if all the information and history might make it harder for younger readers to get into the book. But, she gave us a couple of great characters in Bodhi and Theo; they really are a team that works well together. I enjoyed the old-fashioned sleuthing to solve the mystery of the painting, and I liked how the history fit into the larger picture. I did find the ending to be a bit convenient, but even that was explained in a reasonable (if somewhat implausible) manner. In the end, a highly enjoyable book.